Saturday was the 30th birthday party of one of my closest friends. A few weeks ago an email was sent out listing what food people were bringing. The last line of this message was “Adam – Desserts.” Wait. What? Desserts? The whole thing? I had offered to bring something, but everything!? Wuh oh. After a week or so I had pretty much decided on what I was bringing: Fancy Snickers, Peanut Butter cookies but the request of cheesecake had me baffled. I just didn't know what kind. This cheesecake became my most stressful baking venture so far. It wasn't until the night before that I had the base flavour chosen, and not until the morning of the party that I had decided on the topping. I had been tossing around the idea of white chocolate for a while, but didn't commit to it until I found out that it was my friend's wife's favourite (also my close friend). As for the topping, I wanted something a little lighter, not heavy or rich like chocolate or caramel. I felt it needed to be fruit, something acidic to cut sweetness of the white chocolate. 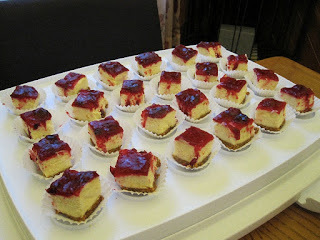 I stumbled upon a bookmarked cheesecake recipe with a cranberry topping. I took a moment to contemplate the combination of white chocolate and cranberries and couldn't believe it didn't occur to me earlier (like weeks earlier). Even though Kraft only suggested three ounces of white chocolate for the entire cheesecake I reduced the sugar to compensate. However, I worried that three ounces wasn't enough to get the flavour I wanted. But this is Kraft, cheesecake experts, so I bowed to their expertise. As for the topping, my only alteration was to remove the cranberry juice. First, I didn't have any, but also, I didn't want the cranberry flavour to be too overpowering or sweet. The sauce, as most are, was simple and easy, but it was the perfect consistency and one taste made me decide that I was making cranberry sauce for Christmas. None of this canned garbage or paying five bucks for a tiny jar of the good stuff. Late into the afternoon I had finally finished all my desserts and I could breath, stress free. Before leaving for the party I made a "quick" stop at my parent's place to pick up my brother, take some pictures (still don't have a camera of my own) and cut the cheesecake (hahahaha :)). Thankfully, my mother offered to help with this. She has a much steadier and more precise hand than I do, which made it possible for me to fancy things up by placing each piece of cheesecake in a paper liner. They looked pretty fantastic. Unfortunately, the flavour of the white chocolate was too subtle. If you truly savoured each bit you could just make it out, but there is definitely room for much more. Otherwise it turned out fantastic. 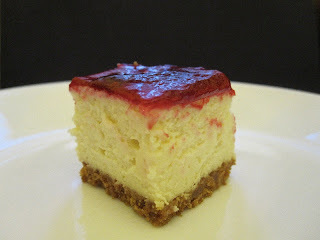 The cheesecake was baked perfectly, and was wonderfully rich, creamy and tangy. Paired with the tart and sweet flavours of the cranberry sauce it was heavenly. I think I actually saw my friend's eyes roll back into her head as she quickly ate three pieces. Oh and a big thanks to Anna from Cookie Madness for suggesting I stick with a graham cracker crust over Oreo. It was definitely the right move. I have to say that all the stress and work was worth it. After all, baking is about sharing and not only was it a wonderful party with food packed to the ceiling, but it was a great time chatting with friends. The compliments I received on my baked goods were more than generous, making me feel quite exceptional. I even got paid for my services. True, it was of the chocolate coin variety; but I'll take chocolate as payment for most things. Just don't tell my managers :). Preheat oven to 325F and have ready a 8” square pan lined with foil. Add crumb mix to prepared pan and press evenly on the bottom of the pan. Using a fork, poke a few holes into the crust to prevent bubbling. Fill a 9x13inch baking pan half way with water and set in oven. Place a medium heat proof bowl over a pot of simmering water. Add white chocolate and heat until completely melted. Remove from heat and set aside to cool. In the medium bowl of a mixer add cream cheese and beat until smooth. Add sugar and vanilla and continue to beat until completely incorporated and smooth, scraping down the bowl as necessary. Add cooled white chocolate and beat until completely incorporated. Add egg and beat until just incorporated. Once all the egg is incorporated, stop your mixer immediately. Remove bowl from mixer and fold batter a few times to make sure that there is no unmixed cream cheese at the bottom of the bowl. Pour filling over cooled crust and bake for 25 to 30 minutes or until cheesecake centre is just set (30 minutes was my time). Allow to cool completely in pan before moving into the fridge to chill for at least 4 hours. In a medium saucepan add water, sugar, cornstarch and whisk to combine. Add cranberries and place saucepan over medium heat. Bring to simmer and cook until sauce thickens. Allow to cool completely before spreading over cheesecake. Return to fridge to chill for another few hours. Wow--those cheesecakes look fantastic and VERY professional! I think you've hit on a classic combination, especially for the Christmas season. On a green paper liner, or garnished with holly, it's a quick transition from a birthday cheesecake to a holiday cheesecake. The tartness of the cranberry sounds much more appetizing than the usual cherry or strawberry. I am not really a cheesecake person (although I would like to conquer making one at some point, I've only attempted cheesecake bars and brownies thus far) but I don't recall ever eating a white chocolate cheesecake with a strong white chocolate flavor. I don't think it was your 'fault' as a baker--white chocolate seems to shine more when it's paired with something salty, like macadamia nuts. 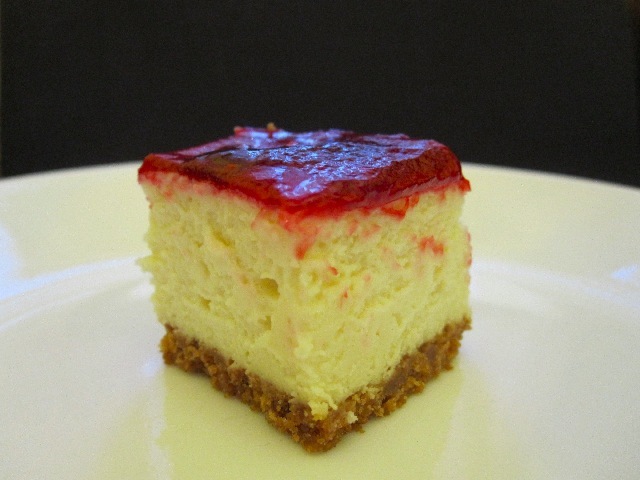 Cheesecake is so easy! Though it is an acquired taste. I know a few people who don't like it. And I think you've made me determined to, at some point, make a cheesecake that actually tastes like white chocolate (or at least more like white chocolate). I only blame myself for not going with my gut but I had never actually had a white chocolate cheesecake before this. I'll know for next time :).